Our state parks encompass one of the most diversified and historically and biologically blessed systems in the world. The system’s healthy but not wealthy and needs a financial shot in the arm. This was the consensus of a small task force recently spending a week visiting California parks, museums, reserves, and mansions between Manhattan Beach and San Francisco. Our seven person task force was part of a statewide association of 1200 park lovers and volunteers appointed by city council members or elected by community members who comprise the California Association of Park and Recreation Commissioners and Board Members (CAPRCBM). This organization sponsors educational programs at statewide California annual conferences, offers training workshops and provides consultation to its members on topics ranging from tot lots to dog parks to the formation of non-profit foundations. Recently, the organization’s leaders decided to explore another educational endeavor - educational park tours. The CAPRCBM Executive Director, Paul Romero, recently retired as deputy director of the California State Parks’ system, designed an exploratory venture covering the state’s picturesque coast, visits to various park attractions, amenities, and operations to discover the qualities and values, as well as problems and issues. In August, 2010, our small group set off on a seven-day excursion to explore the historical sites and reserves, missions, museums, and beaches he selected. Our lodging experiences were comfortable and convenient, especially at Pacific Grove’s Lighthouse Lodge and Suites where we luxuriated in our quarters, each with a rustic stone fireplace, bathroom spa, and complimentary cocktail hour, barbeque dinner, and full service breakfast. Concurrent with our daily travels, Romero and Jim Steelquist, both exceptional photographers, provided nature photography lessons on an individual basis. Each day welcomed a new adventure, entirely different from the proceeding one. Park rangers and directors, docents and volunteers greeted, guided, and taught us park ways and means we had never imaged. Following is a summary of the highlights of our truly enjoyable and rare learning experiences: El Presidio, Santa Barbara After a background briefing, we were led on a walk through the two-acre park that now takes up much of the original 1782 Presidio, the last Spanish fortress and one of four Spanish built military presidios in Alta California. Others were located in San Diego, San Francisco, and Monterey. These presidios played a significant part in the creation of New Spain, protecting the missions and settlers from unfriendly attack and providing a seat of government. 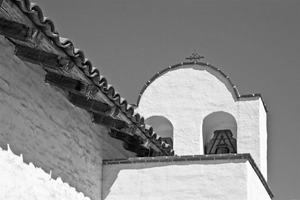 Santa Barbara’s original chapel and several buildings, enclosed in a quadrangle by thick walls, had failed to withstand heavy devastation by earthquakes and by the 1840s were in ruins. Formed in 1963, The Santa Barbara Trust for Historic Preservation began organizing archaeological excavations as well as reconstruction and property acquisition. With the additional aid of the California Conservation Corps and Presidio volunteers, the northeast two sections of the quadrangle corner, the Padre’s Quarters, the Chapel and Bell Tower, two cannon bastions, and the Commandant’s Quarters have all been restored. The whitewashed buildings are constructed of sun-dried adobe bricks laid upon sandstone boulders. Timbers from the Los Padres forest support roofs of red tile. A theatre and a library are also actively utilized. We were escorted by park rangers through the most well-preserved of California’s 21 Spanish missions, the entire complex, from the inspirational church to tallow vats where the fat from slaughtered cattle were turned into soap; into the former living quarters of priests, soldiers and native Americans; demonstrating some of the crafts practiced by native Americans who had been blacksmiths, carpenters, stone masons, master weavers and leather makers. The original gardens and water system are still in place, and burros, goats and horses graze in their period settings. The murals on the chapel walls were especially moving. The chapel is still used for various celebrations and services. The information center boasts a gift shop and exhibits the major historical development of the mission. This park has everything from hiking trails and campsites to a resort and 18-hole golf course. It also provides sailing, fishing, and bird watching opportunities, as well as a colorful marina. 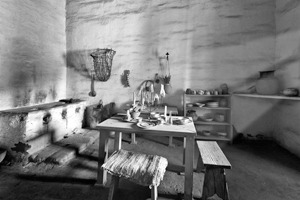 A natural history museum features a diorama on nature, wildlife and early Chumash inhabitants. This 2,435-acred marshland is the epitome of a natural preserve: constantly changing ocean movement, 250 species of shore birds, a six- acre eucalyptus grove that doubles as rookery for great blue heron from January to August, and you can even rent a canoe to paddle the estuary waters. 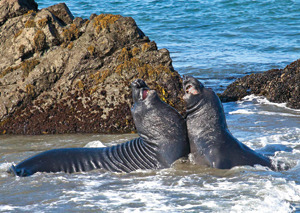 Sea Lions - We stopped at an elephant seal beach to watch these mammals in their molting stages, a few frolicking in the water close to the shore. Designed by San Francisco-based architect Julia Morgan with the watchful input of owner and media magnate William Randolph Hearst, this magnificent cluster of buildings, arose in stages from 1919 to 1947. Hearst’s purpose was not only to have an estate to house his magnificent collection of art and antiques, but to entertain the rich, famous, and powerful. Hearst, who inherited a fortune in mining and real estate holdings and lorded over a nationwide radio and newspaper empire, wanted to provide a social outlet and showcase his immense art collection and private exotic zoo. Throughout the grounds are pools, fountains, gardens, and statuary. The main house, La Casa Grande, along with three spacious guest houses features 56 bedrooms, 61 bathrooms, 19 sitting rooms, 127 acres of gardens, and both indoor and outdoor swimming pools, including the exotic Neptune Pool. Tennis courts, a movie theater, an airfield, and the world’s largest private zoo complete the spacious trappings. Visitors can now select from one of five different 2 ½ hour tours, led by knowledgeable guides. Point Sur Lighthouse - For over 121 years, lighthouse keepers have lived with their families atop the dramatically situated 360-foot high giant Moro rock formation rising from a wide beach. The ancient stone lighthouse still provides horn and lighting guides to passing ships, although modernly automated these days. Much restoration has taken place with volunteers continuing their positive efforts on 1880 vintage structures. Open only on Sundays, our small expedition was welcomed on a special Thursday visit. Named after a highly respected pioneer woman and bisected by Highway One, the main attraction is waterfall cove. Reached after a short trail walk from the parking area, this is the most spectacular and photographed spot on the Big Sur corridor. 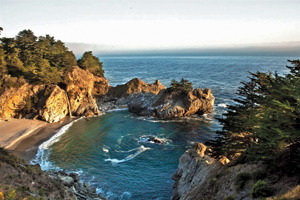 The 3580-acre park rises from the ocean up granite cliffs into forested hills of redwood, tan oak, madrone and chaparral from a picturesque circular bay highlighted by 80-foot McWay Falls, the only such cascade on the California Pacific front. This is an example of a multi-use park for camping, hiking, rafting, inner-tubing, and relaxing. The 810-acres contain 218 campsites along the Big Sur River. Trees enhance the park’s beauty featuring redwoods, conifers, oaks, sycamores, cottonwoods, maples, elders, and willows. Wildlife includes blacktail deer, gray squirrels, raccoons, skunks, and birds. There are scores of hiking trails. A lodge with 61 guest rooms and cabins accommodate visitors, and provide swimming pools and ample meals. There is also a conference center, café, and grocery store. This State Historical Park is adjacent to Monterey’s famous wharf and the Cannery made famous by John Steinbeck, and includes the incomparable Aquarium. The grounds, which feature numerous historical structures, include both California’s first theatre and the Monterey Customs House, which we toured, where the American flag was first raised over California. Monterey also served as both Spain’s and Mexico’s capitals and was the site of the state’s first constitutional convention. The Custom House features sacks, trunks, boxes and commodities replicating those of the trading communities of early California. In 1846, what was to become The First Theatre served as a lodging house and tavern for sailors, becoming a theatrical enterprise in 1850. Donated to the State of California, plays, musicals and melodramas of all types were performed until age took the building’s toll. Another example of the adobes built in the 1840s was Casa Soberanes, which contains furnishings that are a blend of early New England and China trade pieces mixed in with modern Mexican folk art. This fabulous destination provides both sandy and pebbled beaches, tide pools, rocky coves, cypress groves, varied plant communities and picnic areas. Otters, seals and sea lions were playing as we walked through Monterey Cypress. Inhabited by dozens of mammal types, we saw sea lions, and both gray and blue whales, as well as many bird species and abundant monarch butterflies. Two hundred bird species live or migrate through the parklands and among offshore rocks, including pelicans, gulls, and cormorants. Recreation includes photography, landscape painting, hiking, jogging, sunbathing, swimming, picnicking and wildlife-watching. There is no camping here. Set in a 107-acre park along the shoreline, Asilomar is cradled by pine forests and white-sand beaches. The attractive grounds contain 30 rustic structures, including hotel lodges, a huge dining room and auditorium, as well as 11 buildings comprising the original YWCA conference center, designed by Julia Morgan of Hearst Castle fame. There is a swimming pool and volleyball court, and swimming beaches are close by. A variety of lodging arrangements are possible. Bordering the west side of the conference center are white sand dunes, vegetatively restored with native plants. A boardwalk provides close-up views of this living example of plant succession. With spectacular views of Marin County, San Francisco and the Golden Gate bridge, Angel Island has had a colorful history through the ages as a Miwok fishing and hunting site, a Civil War U.S. Army post and garrison for infantry companies campaigning against American Indians, a discharge destination during the Spanish-American War, a recruitment and replacement depot for troops returning from World War I, an embarkation site for WW II troops heading to the Pacific war zone, a processing facility for prisoners of war, a Nike missile battery, and now a popular tourist attraction. 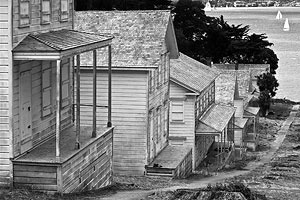 From 1910 to 1940, Angel Island was the equivalent of the East Coast’s Ellis Island, processing nearly one million immigrants from more than 80 countries to ensure that new arrivals were legal, healthy, and self-sufficient. More that 175,000 Chinese, answering to the Chinese Exclusion Act of 1882 were detained for periods of three days to two years while their entry applications were being processed. Most were granted entry; however, many had to return to their homeland. Many expressed their anxiety and despair by writing and carving on the wooden walls, preserved until today. Reachable year-round by public ferries, the Island boasts of a boat marina, fishing, abundant animal life, including deer and raccoons, harbor seals and sea lions, scrub jays, humming birds, hawks, owls and pelicans. There are also four environmental camping areas, a kayak camp, hiking and bicycling, and tours of various structures reachable by tram. Ranger Roy McNamean and two colleagues served as our tour guides, busing us to several restored buildings, some served by docents in ancient military uniforms, some housing ranger staff and their families, although many of the 57 buildings still standing were in depreciated condition. Another of the Island’s major activities is providing numerous educational programs for school children in the bay area. California State Railroad Museum - Since 1976, this popular Sacramento destination averages over 500,000 guests annually from throughout the world. There are six reconstructed and new buildings covering 225,000 square feet, which house stimulating exhibits, like 21 meticulously restored locomotives and cars illustrating how railroads, especially in the West, shaped the entire country. Enthusiastic and knowledgeable docents provided the background of such novelties as old style Pullman sleeping cars, a dining car filled with railroad chinaware representing major railroad companies throughout the U.S., and a traveling Railway Post Office.